Words, Words, Words is a wide–ranging collection of literary essays that astonish the reader with their candor, insight, and generosity. Many of them reveal the absurdity that so often underlies our most passionate thoughts, our most cherished moments, even our most disturbing fears and recognitions. They echo everywhere with a kind of cosmic laughter that never lets us forget we are constructs of our own capacity to see through language — that at a most fundamental level, what we think about our selves is inevitably an extension of what we learn in our reading of others. Here we also get to find out what Bowering most cherishes about writers and writing: who Al Purdy was; what David McFadden's work pays attention to; when the world of poetry changed; where Artie Gold appeared as a light fixture in our darkness; how bpNichol's Martyrology legitimized the vernacular; why we cannot read history without encountering Shakespeare. Neither precious nor shy, their subjects range from the sublime to the ridiculous — from the inarticulate nature of grief to a modest proposal for the uses of the dead. Together, they constitute a history of the education of Canada's first Poet Laureate: from his adolescent dreams of becoming a writer; his early recognition of the discipline required to forge a life in language; the ongoing feud between the TISH authors and the self–appointed nationalist police; Bowering shares with us what he has learned in a lifetime of exercising his craft — even including what constitutes bad writing. Whether in deconstructing the cliches of genre fiction; the ghetto of identity politics; the hapless failure of any attempt to harness language to utilitarian purposes; the abuse of language required to write "sensitive" prose and verse; he constantly reminds us that the first and most important rule of life is: pay attention. Canada's first Poet Laureate, George Bowering is an Officer of both the Order of Canada and the Order of British Columbia. 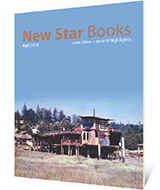 Approximately five percent of Bowering's 100+ published works are available from New Star Books: the BC historical trilogy Burning Water, Caprice, and Shoot!, and The Box (short stories). He taught at Simon Fraser University from 1972 until his retirement in 2001. He lives in Vancouver.